Click here to see the TI-Nspire CX Price on Amazon. Another school year requires another update to my post comparing the TI-84 and TI-Nspire. With each passing year, the gap between the two seems to grow as the TI-Nspire gets update after update from Texas Instruments, and the TI-84 stays more or less the same. A year ago, the TI-Nspire CX was released bringing color, backlit screens to the platform, and this summer, all TI-Nspire models received a refresh with the release of TI-Nspire OS 3.2. As a result, I’ve updated the article to reflect the latest information. For those with a short attention span, it’s not really much of a contest any more, as the TI-Nspire CX vs. TI-84 Plus has a clear winner, the TI-Nspire CX. If this article still isn’t enough for you, you may want to check out my standalone TI-84 review and TI-Nspire CX review. One of the most common questions students and parents wrestle with when buying a graphing calculator is the TI-84 Plus vs. TI-Nspire. I’ve come to realize that most end up making their decision without truly understanding the differences between the two, just simply picking one off the shelf, not realizing the $10 some choose to save by picking up a TI-84+ will actually put their child at a disadvantage to their TI-Nspire classmates for the next 4 years of high school. The TI-84 Plus is not the cutting edge technology it once was, even though it has received some software upgrades from Texas Instruments to keep it from completely falling out of the conversation. The TI-Nspire CX is TI’s first color graphing calculator and is their calculator of the next decade. Both are very popular in the parts of the US where the ACT rules because their lack of a CAS (computer algebra system) makes them legal for the ACT. That is a big reason why I once used the TI-84 Plus in my classroom, and today my students use the TI-Nspire CX. I’ve spent countless hours instructing students on their use, so my experience can help you make an informed decision. This family of calculators has been around so long it requires a brief history lesson. In 1996, Texas instruments launched a new calculator it called the TI-83. A few years later, they updated it by adding flash memory, which allowed for apps and the ability to upgrade the operating system, and the TI-83 Plus was born. Then in the mid 2000’s the TI-84 plus Silver Edition was born, which, other than an upgraded shell and the addition of USB, still operated amazingly like the original TI-83. The TI-84’s greatest strengths and weakness both stem from the fact that it’s a 16-year old platform. Having been around all that time, the hardware and software support is very mature. The Texas Instruments website offers a large variety of free educational apps (and a few puzzles and games) that are available for download, and an active independent programming community has worked to provide TI-84 owners a huge variety of programs, many of them games. Educators will find countless products that allow thermometers, motion detectors, voltmeters, and more to be plugged into a TI-84 for classroom experiments. Most teachers are also very familiar with the TI-84 and have no problem explaining its intricacies to students new to graphing calculators. On the other hand, a decade and a half is a long time to hang on to a platform. Is anyone out there still running Windows 95? With the 84+, TI has issued some operating system updates through the years, and one of the recent upgrades, OS 2.53, was a doozy, finally offering 84 plus owners the ability to input their calculations in “mathprint.” Basically, that means fractions look like fractions, calculus symbols appear the way they do in a textbook, and much more. For more on this upgrade, check out my TI-84+ upgrade video. However, even with the massive improvements in OS 2.53 (and the smaller upgrades of the most recent OS 2.55), the calculator is behind the times. Students today were raised in the computer era, meaning they are comfortable with multiple windows, drop down menus, point and click interfaces, and saving documents for later use. All of these features are noticeably absent from the TI-84 plus. Don’t get me wrong, I think the TI-84 is a great calculator. It’s just that its best years are behind it. Pros: Incredibly durable build, many teachers can proficiently teach with it, large variety of programs and apps available. Cons: Not as user friendly as TI-Nspire family. Interface and technology very outdated, any remaining OS upgrades probably minor tweaks. The TI-Nspire was released to the public in 2007. As you might expect for a device launched 10 years after the original TI-83, the technical upgrades were significant. Visually, the difference in detail is significant, as the Nspire offers much higher resolution. By 2011, Texas Instruments saw the need for even further upgrades and issued the TI-Nspire CX, their first full color calculator. Many of the innovations the personal computer has ushered in have been included as well. You’ll feel more like you are using a Windows or Mac interface as drop-down menus, documents, point and click, and multiple windows were all included. In my experience, longtime TI-84 users can feel a bit frustrated during the transition to an Nspire, since they are so comfortable with the 84’s older interface. However, for new users, particularly students, it’s much easier to get started with a TI-Nspire compared to a TI-84 plus. Generally speaking, most of the major functions of a graphing calculator have been simplified on the TI-Nspire. One of the most obvious examples is in graph mode. 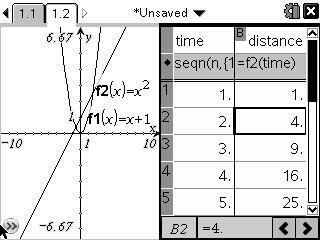 To find an intercept, maximum, or minimum, the TI-84 plus requires you to navigate away from the graph to a “CALC” menu, select intercept, max, or min, then scroll the graph and select a left bound, right bound, and then give an initial guess. This clunky process is counterintuitive to many students. To find the same information on the Nspire, a drop down menu is pulled down with the graph still on the screen. You select “trace” and simply move the cursor near a maximum and it “locks in” on it. For teachers, there are dynamic capabilities on the TI-Nspire CX that allow for teaching lessons that the TI-84 is in incapable of. On one screen, you can have an equation, its graph, and an associated table of values. Drag the graph to a new position, and you can see the effect that it has on the other two. There are many such examples of where the Nspire CX is an improvement over the TI-84. The biggest drawback is that some teachers are still more proficient at teaching with the TI-84+ than with the TI-Nspire, although I think this is changing. Early on with the Nspire series, Texas Instruments found it hard for people to give up the wildly popular TI-84 plus, even for something better, so much so that they made an interchangeable keypad for the Nspire that allowed it to look and function like a TI-84. As the Nspire series has gained popularity, they’ve abandoned this approach, the the TI-Nspire CX does not have this ability. You won’t miss it. Visit the T3 professional development conference sponsored by Texas Instruments, and you’ll see hundreds of session where teachers are learning to use the TI-Nspire and only a handful on how to use the TI-84. Additionally, the Nspire CX only continues to gain capabilities that the TI-84 will never have, the latest of which are 3D graphing, graph conic sections and “x=” equations, a built in rechargeable battery, computer-like touchpad for controlling the cursor, the ability to load photographs, and a new thinner, lighter build. Every year since its release, Texas Instruments has issued at least one major upgrade for the TI-Nspire platform, and they are always completely free. They’ve also made all of their upgrades backwards compatible, meaning even students and teachers who purchased the original Nspire back in 2007 have been able to take advantage of all the latest features. I don’t see this trend changing. The TI-Nspire seems to be a platform that gives Texas Instruments a lot of freedom to respond to feature requests from teachers and students, and they are taking full advantage. The TI-Nspire CX CAS looks and functions a lot like a regular TI-Nspire CX, but it has computer algebra system (CAS) capabilities. This means it has similar functionality to a TI-89 Titanium. For more information on the TI-Nspire CAS, read my TI-Nspire and TI-Nspire CX CAS review. Just be sure when buying that you understand that the TI-Nspire CAS has advanced capabilities and may not be allowed with certain teachers or on certain standards tests. Click here for information about legal calculators on the SAT, or here for calculators on the ACT. If you’re given the option, I have to strongly recommend the TI-Nspire CX. I know there are some loyal TI-84 users hanging on, but, honestly, it’s like comparing the your original flip phone to the latest iPhone. Virtually everything about the TI-Nspire CX is vastly superior to the TI-84 plus, including the display, color, touchpad, graphing features, documents, point and click interface, dropdown menus, etc. It’s not a fair fight. When parents and students ask me, I point them towards the TI-Nspire every time. It’s what I use with my students, and I’ve been thrilled with their success using it. If you’re a teacher or student who’s in a school that’s been hanging onto the TI-84 platform until now, and you need some help with your new TI-Nspire, please consider my new TI-Nspire Tutorials book for beginners.